Washington Therapist: Keith Miller & Associates Counseling - Therapist 20036. 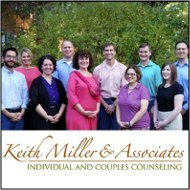 Send A Message To Keith Miller & Associates Counseling. Session Fees: Please visit the website for a list of our fees. Do you know if counseling is really going to work for you? In our experience, successful therapy outcomes are the result of an excellent match with your therapist. That's why we offer a FREE phone consultation, and in some cases, a FREE 20 minute in-person consult. Marriage & Relationship Issues: Want to build trust? Improve communication? Recovering from infidelity? How about spicing up life in the bedroom? We are couple therapy and intimacy specialists. Premarital Counseling: Create a divorce-proof marriage! Build a strong foundation for a your lifetime and learn what successful couples do to make a satisfying relationship. Addiction: Find support for recovery from alcohol and drug addiction with our highly experienced substance abuse counselors. Is love addiction or internet addiction wrecking havoc in your relationship? Do you want relief from emotional eating, eating disorder, or food addiction? Do you have compulsions that seem impossible to change? We work successfully with these issues every day and look forward to your call. Anxiety: If panic, fear, and phobias are exhausting you, we can help you get your life back. Depression: Depression doesn't have to take over your life. Managing problematic moods without relying on medication is one of the most researched areas of psychotherapy. Learn more about mood disorders here. Anger Management: Want more than traditional anger management approaches? We can help you get to to the source the fuels the anger. To learn more about how we work with anger, read this article. Our referral coordinator will help you choose from our many counselors' specialties, office locations, and schedules. Reaching a live person at a counseling practice is sometimes a two-day game of phone tag. Tiffany can often answer your call live or return it promptly from 9am-7pm Monday-Friday, and often on the weekends. Our psychotherapy is done collaboratively with you, so you'll know if it's meeting your expectations. We take pride that we use cutting-edge models of psychotherapy that allow us to monitor progress and make adjustments when needed.